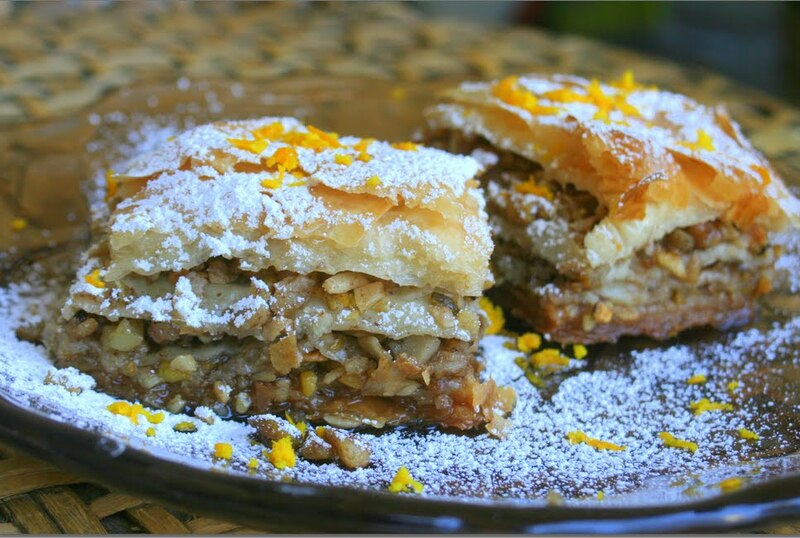 Baklava is a rich sweet pastry made of layers of phyllo dough, filled with chopped nuts and sweetened with a honey based syrup. A very high calorie food that is truly a delight for any occasion. The baklava is a recipe that cannot go wrong. A very easy recipe but a time consuming one. I followed Alton brown's recipe for baklava. I made few changes to the original recipe. It is definitely a must try sweet if you are a sweet lover. Here's the recipe. Grind the cinnamon stick and whole allspice. Pulse grind each nut separately in the food processor. Use a strainer and separate the powder from the chopped nuts. Mix in the 'powdered all spice and cinnamon' and sugar to the finely chopped nuts and set aside. Use a large non stick tray (13 X 9 X 2 metal tray). Brush with melted butter on the bottom and sides. 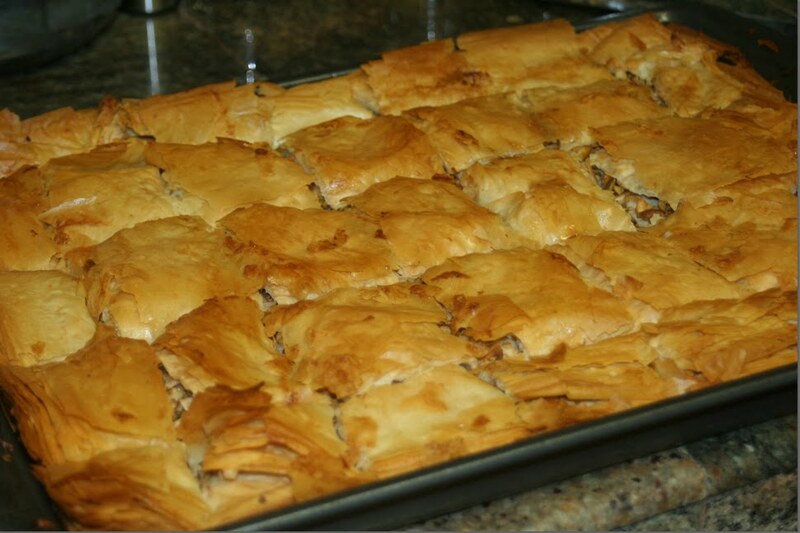 Open the phyllo sheet packet and cover it with a moist towel so that the sheets do not dry. Please pay attention while following this recipe as there are repeated lines which might be confusing. Take one phyllo sheet and place it in the tray. Brush melted butter using a brush. Place another phyllo sheet and brush it with butter. Repeat this for 8 more sheets, total of 10 sheets. Stir in the nuts and spread one third of the nuts evenly on top of the 10th sheet and cover it with a sheet. Brush the sheet gently with melted butter and place another sheet. Brush with melted butter. Repeat for another 4 sheets for a totol of 6 sheets above the nuts. Again spread half of the remaning nuts evenly and place a sheet and brush with melted butter. Repeat for another 5 sheets for a total of 6 sheets above the nuts. Again spread the remaining nuts evenly and place a sheet and brush with melted butter. Repeat for another 10 sheets. Brush butter generously on the top layer and place it in the oven for 15 minutes. Remove from oven and cut into 1 inch squares and place it in the oven again for approximately 40 minutes. 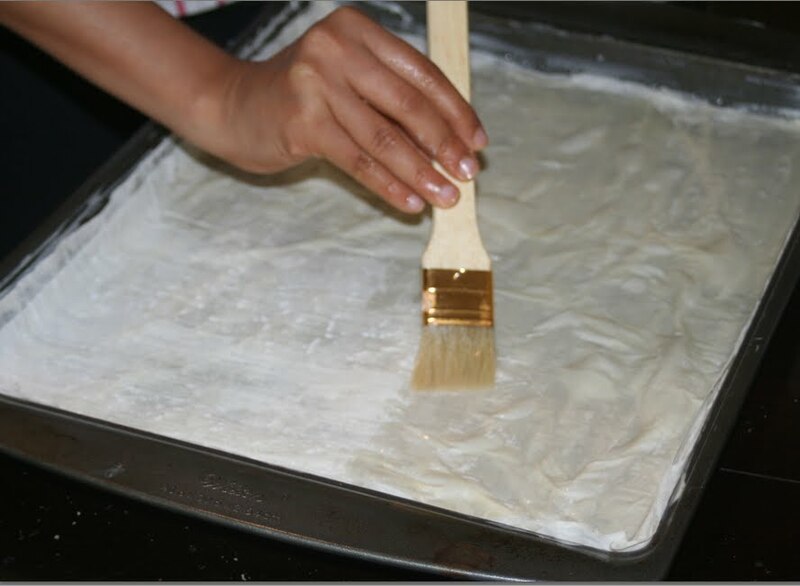 Remove the top most crusty layer and allow it to cool down completely - approximately 1 to 2 hrs. Combine the honey, water, sugar, cinnamon stick and orange peel in a 4-quart saucepan and set over high heat. Stir occasionally until the sugar has dissolved. Once boiling, boil for 4 to 5 minutes, stirring occasionally. Remove from the heat and strain the syrup to discard the orange peel and cinnamon stick and cardamom pods. After the baklava has cooled for 2 hours, re-cut the entire pan following the same lines as before. 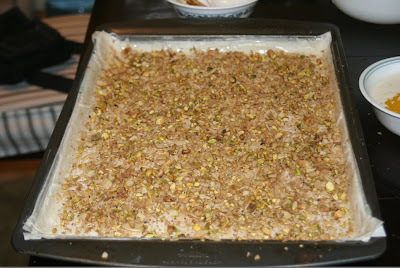 Pour the hot syrup evenly over the top of the baklava, allowing it to run into the cuts and around the edges of the pan. Allow the pan to sit, uncovered until completely cool. For best results, cover and store at room temperature for at least 8 hours and up to overnight before serving.